Charlie Hebdo has gone too far. In its first publication following the Jan. 7 attack on its Paris office, in which two Muslim gunmen massacred 12 people, the once little-known French satirical news weekly crossed the line that separates free speech from toxic talk. Charlie Hebdo‘s latest depiction of the prophet Mohammed — a repeat of the very action that is thought to have sparked the murderous attack on its office — predictably has given rise to widespread violence in nations with large Muslim populations. Its irreverence of Mohammed once moved the French tabloid to portray him naked in a pornographic pose. 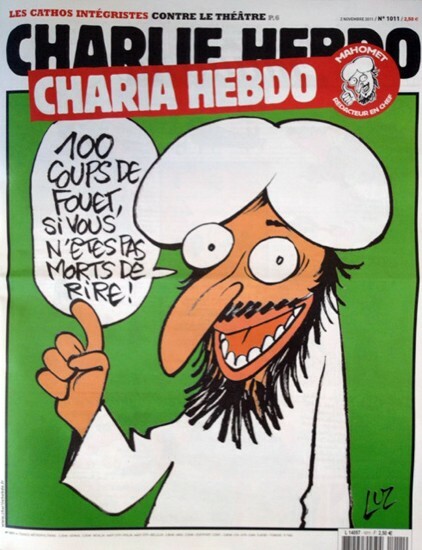 In another caricature, it showed Mohammed being beheaded by a member of the Islamic State. French President Francois Hollande, apparently, disagrees. He defendsCharlie Hebdo‘s latest depiction of Mohammed by saying that protesters in other countries don’t understand France’s embrace of free speech. But even as Hollande defends Charlie Hebdo‘s right to publish images of Mohammed that many Muslims consider sacrilegious and hateful, his government has imprisoned dozens of people who have condemned the magazine with talk the French won’t tolerate. Those arrested are accused of speaking in support of the attack on the magazine, and a separate assault on a kosher store in Paris by a lone Muslim gunman with links to the men who attacked Charlie Hebdo. Twenty-two years later, the Supreme Court ruled that forms of expression that “inflict injury or tend to incite an immediate breach of the peace” are fighting words that are not protected by the First Amendment. If Charlie Hebdo‘s irreverent portrayal of Mohammed before the Jan. 7 attack wasn’t thought to constitute fighting words, or a clear and present danger, there should be no doubt now that the newspaper’s continued mocking of the Islamic prophet incites violence. And it pushes Charlie Hebdo‘s free speech claim beyond the limits of the endurable. The principle that Mr. Wickham seems to be enunciating seems to be that freedom of speech is all very well unless someone is upset by what is being spoken or written, in which case, that speech should be suppressed. I wonder if he has really thought through the implications of this principle. If the idea that only speech that offends no one should be permitted is applied even-handedly, than only the blandest sort of platitudes can be allowed, given that there are so many people offended by seemingly innocent expressions. Of course, this principle of forbidding “toxic talk” cannot be even-handedly applied even with the best efforts. In practice, it will be those quick to use force, either violent or otherwise whose feelings will be spared. A pornographic portrayal of Jesus or Buddha is permitted. Christians and Buddhists do not usually respond to insults with bombs or guns. A pornographic portrayal of Mohammed is forbidden. Muslims often respond to insults with murderous rage. Mr. Wickham justifies this sort of distinction by invoking the example of a man crying fire in a crowded theater. The editors of Charlie Hebdo knew that their cartoons would provoke violence that would create a clear and present danger to the peace. Therefore, their fighting words should be prohibited. He further accuses the French authorities of hypocrisy in defended Charlie Hebdo’s free speech rights while denying the rights of those who have called for violence against the magazine. I do not think that DeWayne Wickham really understands the meaning of the phrase inciting to violence nor does he appear to make a distinction between speech that someone may find offensive and speech that calls for violence against a person perceived to be causing offense. The former must be permitted or there is no freedom of speech. The latter must be forbidden or the violent will deny freedom of speech. I will try to explain what I mean. If I am addressing a rally of the Ku Klux Klan and I state that everyone in the audience should go out and kill an African-American ( I know what word they would really use, but nevermind.) that would clearly be an incitement to violence. If someone actually did kill someone afterwards, I might be considered legally responsible. I would certainly be morally responsible. Clearly, such speech ought not to be allowed. If, on the other hand, I made the statement that African-Americans were all stupid, that would not be an incitement to violence, even if such a statement would certainly be offensive to an African-American reporter covering the rally. If that reporter jumped up onto the podium and punched me in the face, he would be arrested and charged with assault. The fact that he found my speech offensive would not be considered justification for his action, although a jury might not convict him. The Black reporter would be responsible for his action, not me. The statement that African-Americans are all stupid is protected speech, even if the statement is offensive and even hateful. In like fashion, Charlie Hebdo is not responsible for the actions of Muslims who find its cartoons offensive. They do not have to read the magazine. They can publish their own magazine mocking the sort of people the cartoonists and editors are likely to be. To blame Charlie Hebdo for their actions is really rather insulting since it implies that those people are savages who cannot really be responsible for their actions. To argue that this magazine should be in any way suppressed because of the threat of violence is giving the violent a veto over our speech and thus ending the concept of free speech. One might think that the dean of a school of journalism would understand that. President Obama couldn’t be bothered to attend the anti-terrorism rally in Paris, even though almost every other world leader consequence somehow found the time to show up. He still cannot say the words Islamic and terrorism in the same sentence. He is opposed to the slander of the prophet of Islam. And now, he would like to keep people from publishing articles critical of Islam. At this point, it is fair to wonder just whose side is he really on. Is Barack Obama on the side of freedom or Islamic terrorism. I don’t believe the conspiracy theories that hold that President Obama is secretly a Muslim or some sort of Manchurian candidate intent on destroying America from within, but he does seem to express more sympathy towards people sworn to destroy us than he ought and he is too inclined to appeasement of the worst villains in the world. From the Daily Caller. President Barack Obama has a moral responsibility to push back on the nation’s journalism community when it is planning to publish anti-jihadi articles that might cause a jihadi attack against the nation’s defenses forces, the White House’s press secretary said Jan. 12. “The president … will not now be shy about expressing a view or taking the steps that are necessary to try to advocate for the safety and security of our men and women in uniform” whenever journalists’ work may provoke jihadist attacks, spokesman Josh Earnest told reporters at the White House’s daily briefing. The unprecedented reversal of Americans’ civil-military relations, and of the president’s duty to protect the First Amendment, was pushed by Earnest as he tried to excuse the administration’s opposition in 2012 to the publication of anti-jihadi cartoons by the French satirical magazine Charlie Hebdo. The White House voiced its objections in 2012 after the magazine’s office were burned by jihadis, followings its publication of anti-jihadi cartoons. Earnest’s defense of tho 2012 objections came just five days after the magazine’s office was attacked by additional jihadis. Eight journalists, two policeman and a visitor were murdered by two French-born Muslims who objected to the magazine’s criticism of Islam’s final prophet. In 2012, “there was a genuine concern that the publication of some of those materials could put Americans abroad at risk, including American soldiers at risk,” Earnest said. I can understand the concerns for the safety of American service people and civilians, but don’t they understand that this is just what the sort of terrorists who murdered those cartoonists in Paris want? If we watch what we say lest someone in the world might be offended enough to attack us, aren’t we giving the terrorists a veto on free expression? And, aren’t we encouraging more offended people to take up arms. 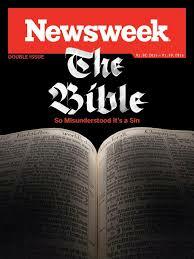 Not too long ago, Newsweek ran an article that many Christians believed was a hit piece against their faith. This is not atypical of the way that the mainstream media treats Christians these days. Should a group of Christians bomb the office of Newsweek or gun down the writer of that piece? That seems to be the only way to get any respect. So, whose side is he on? The President of the United States ought to be unambiguously and unequivocally on the side of freedom. He should be saying that the future does not belong to those that oppose the course of freedom. If Islam cannot bear to be examined, than it belongs on the trash heap of history alongside Communism and Fascism. That’s what everyone is saying in support of the French magazine Charlie Hebdo. Right now everyone is standing up for the editors and cartoonists’ right to satirize and ridicule whatever they choose even in the face of violence. I am afraid, however, that once the dust settles and the shock and memory of the recent attack fades, there is going to be an almost irresistible temptation for some people to blame the victim and propose craven counsels. The cartoonists and editors brought their trouble upon themselves, the argument will run. They should have known better than to mock the prophet of such an easily offended and potentially violent following. Certainly, they have a right to print whatever they want, but surely they should exercise some degree of prudence and only mock safe targets, like the Pope. Consider this partial transcript of a White House press briefing, provided by Breitbart.com, from a earlier time when Charlie Hebdo published offensive cartoons way back in September 19, 2012. REPORTER: The French government has decided to temporarily close their embassies and schools in several Muslim countries after a satirical weekly, Charlie Hebdo, that published cartoons mocking the Prophet Muhammad. Is the White House concerned that those cartoons might further fan the flames in the region? CARNEY: Well, we are aware that a French magazine published cartoons featuring a figure resembling the Prophet Muhammad, and obviously, we have questions about the judgment of publishing something like this. We know that these images will be deeply offensive to many and have the potential to be inflammatory. But we’ve spoken repeatedly about the importance of upholding the freedom of expression that is enshrined in our Constitution. In other words, we don’t question the right of something like this to be published; we just question the judgment behind the decision to publish it. And I think that that’s our view about the video that was produced in this country and has caused so much offense in the Muslim world. Now, it has to be said, and I’ll say it again, that no matter how offensive something like this is, it is not in any way justification for violence — not in any way justification for violence. Now, we have been staying in close touch with the French government as well as other governments around the world, and we appreciate the statements of support by French government officials over the past week, denouncing the violence against Americans and our diplomatic missions overseas. Sure, they have a right to publish what they want, but they shouldn’t if what they publish leads to violent objections. As a call for freedom of speech and the press, this is somehow not quite as bold as Voltaire’s apocryphal, “I may not agree with what you say, but I will defend to the death your right to say it”, or even Patrick Henry’s, “Give me liberty, or give me death”. It seems more like, “Give me liberty, unless someone is offended enough to shoot or bomb me.” Ian Tuttle has some more recent examples of this rush to blame the victims, National Review Online. The reason that Muslim terrorists attack publications like Charlie Hebdo is because they have good reason to believe that such attacks will be successful in achieving the goal of silencing criticism of Islam. This strategy wouldn’t work if the political elites in Europe and America really believed in freedom of speech or at least had any real courage in confronting the threat that Islam poses to Western civilization. As it is, they are all too ready to condemn any criticism of Islam as racism, bigotry, and Islamophobia. The Terrorists hardly needed to bother with shooting anybody. Given time, I am sure the French government or the EU would have been happy to shut down Charlie Hebdo for its hate speech. The problem with this sort of censorship against commenting on an increasingly obvious threat is that it cannot work in the long run. The average French, German, or British citizen is aware that there is a problem, no matter how much his betters try to reassure him. If the mainstream parties and politicians of Europe will not address the problem with reasonable solutions, European voters might well turn to the people who will talk about it, the real racists and fascists. Their solution is not likely to be reasonable or pretty, though perhaps more desirable than a Islamized Europe. Prophet Muhammad (Sallallahu ‘Alayhi Wa Sallam) – Our Honor, Our Pride, Our Ideal, Be it Cartoons, Movies, or France, This is Our Stance (annoor.wordpress.com) I don’t love the false prophet and I reserve the right to mock him as much as I want. Why CBC News hasn’t shown Prophet Muhammad caricatures (cbc.ca) Cowardice. On November 2,2011 the French satirical magazine Charlie Hebdo had its offices fire-bombed. Today gunmen attacked the offices of Charle Hebdo killing 12 people. The motivation for these attacks remains unclear. One might suspect these attacks might have something to do with the magazine’s history of making fun of Islam, but Islam is the Religion of Peace and surely no Muslim were resort to violence to avenge an insult to his faith. All kidding aside, here is the story from Sky News. Three masked gunmen stormed the offices of the controversial publication, which has previously been attacked for its portrayal of the Prophet Mohammed. They were armed with Kalashnikov rifles and a rocket-propelled grenade during the attack on Wednesday morning. French President Francois Hollande has declared a national day of mourning tomorrow. They were let into the building by a female employee who was threatened along with her daughter and forced to punch a security code into a keypad to allow them inside. The editor and a cartoonist for the newspaper, who went by the pen names Charb and Cabu, were among those killed. Radio France chief executive Mathieu Gilet announced on Twitter that a contributor, Bernard Maris, was another of the victims. Two police officers were also among the dead, including one assigned as Charb’s bodyguard after death threats were made against him. Another 11 people have also been injured, at least four seriously. The vehicle was later abandoned and is being examined by forensics teams. The response by world leaders seems to be encouraging. President Hollande condemned the attack as “an act of barbarism”. In a televised address, he said: “We have to respond according to the crime, first of all by finding the authors of this infamy and we have to ensure that they are arrested, judged and… punished very severely. “Everything will be done in order to apprehend them. “We must also protect all public buildings… security forces will be deployed everywhere where there could be a threat. Parisiens turned out at 7pm on the Place de la Republique in a show of support for the victims and of the right of free speech. US President Barack Obama and the Russian leader Vladimir Putin both condemned the shootings. Unfortunately, British Prime Minister Cameron and French President Francois Hollande don’t really mean what they are saying. If there is anyone in Europe still clear minded enough and with the intellectual integrity to make logical conclusions based on available evidence, he will have to conclude that Islam, as it is currently practiced, is simply not compatible with democratic values such as freedom of speech and freedom of the press. And if such a person is brave enough to state such conclusions publicly, statesmen like Cameron and Hollande will be quick to attack him as a racist, a bigot , and an islamophobe. I expect that there will be statements on how this atrocity is in no way connected to Islam. The criminals involved are extremists and not at all like the majority of peaceful Muslims. This isn’t actually true, but it keeps them from having to face up to the real issues involved. Hassen Chalghoumi, imam of Drancy mosque in the Paris suburb of Seine-Saint-Denis, said: “These are criminals, barbarians. They have sold their soul to hell. This is not freedom. accurate, he is more tolerant and westernized than most French Muslims and has become rather controversial for his friendship with Jews and his opposition to Islamism. I am also afraid that he is not being completely honest about the traditions and doctrines of his faith regarding the life and deeds of Mohammed. Mr. Chalghoumi is likely sincere in his desire to reform Islam in a more peaceful direction but the controversy he is facing illustrate the difficulty of any reform is Islam. The simple truth is that the gunmen were following Mohammed’s example. Mohammed did, in fact, sanction the murder of poets who ridiculed or opposed him. Stories about Muhammad’s life and sayings are an important source of Islamic law and doctrine, and many of these stories affirm his violent deeds. Since Mohammad is considered a perfect man whose example every Muslim should follow, this presents a problem. Mohammad cannot be simply dismissed as a man who lived in a violent time and place. His example and the Koran applies universally. In order for Islam to become a true religion of peace, Muslims are going to have to reject what seems to be an essential part of Muhammad’s and ignore those verses of the Koran which seem to promote violence against the unbelievers. I am not sure it is reasonable to expect that of them. In the meantime, we must not let fear, whether of terrorist attack or of being considered politically incorrect, deter of criticizing or ridiculing Islam when criticism or ridicule is warranted. If we allow the terrorists and the bullies to l us what is acceptable to say or laugh at, we will be giving away the freedoms we have worked so long and hard for. Nobody likes having their faith laughed at. Most of us in the West have learned to respect the right of people to say things we don’t want to hear. If the Muslim population in the various European countries and here in America cannot learn to respect the freedoms of others, they are welcome to move back to their home countries where freedom is a distant dream. Britain will ‘never give up’ freedom of speech, David Cameron says after Charlie Hebdo attack (telegraph.co.uk) They pretty much already have, unfortunately. I don’t know where anyone could possibly get the idea that Islam teaches violence. Here is something from the Guardian that might explain matters. Muhammad cartoon sparks attack on French magazine Charlie Hebdo.The French government has rushed to the defence of the satirical magazine Charlie Hebdo after an arson attack on its headquarters as it published an edition featuring a cartoon of the prophet Muhammad on the cover as “guest editor”.The Paris offices of the magazine were gutted after a fire broke out at 1am following reports of a petrol bomb being thrown through a window. Charlie Hebdo’s website also appeared to have been hacked to show images of Mecca. I wonder how long the French dhimmis are going to pretend they care about free speech. François Hollande, the Socialist presidential candidate, told Le Monde newspaper the incident demonstrated that the struggle for press freedom and “respect of opinions” was a permanent battle, adding that “fundamentalism must be eradicated in all its forms”. Those fundamentalist Catholics are a real problem in France, or maybe he means the Huguenots. So far though, French Muslims are comdemning the violent act. The main representative body of the Muslim faith in France, the French Muslim Council (CFCM), condemned the fire, while its president pointed out that caricaturing the prophet was considered offensive to Muslims. “The CFCM deplores the deeply mocking tone of the newspaper towards Islam and its prophet, but reaffirms with force its total opposition to any act or form of violence,” it said. Which is good, so far as it goes. We should also allow for the possibility that some other group is behind this, though given past acts when their prophet is insulted, I suppose the most likely suspect is a radical Muslim. In any event, here is the offending cartoon. I guess I would be offended too, if I were Muslim, but probably not enough to bomb the magazine. Thanks to The Volokh Conspiracy for this.